Kaua‘i Harley Davidson Manager John Baroni is seen here sitting on his own Harley Davidson at the Puhi dealership. More than a century ago, somewhere in Wisconsin, a young man envisioned a bicycle with an engine. What happened next is history. Harley Davidson motorcycles would write — and keep rewriting — motorcycle development since then. A flagship symbol of American-made quality, a Harley Davidson is much more than a beautiful and loud piece of machinery. Owning one of these legendary motorcycles can be a life-changing experience. “I don’t sell motorcycles, I sell lifestyles,” said John Baroni, manager at Kaua‘i Harley Davidson in Puhi. “It’s an old Harley saying, and it’s still going strong,” said Baroni, a lifelong biker who has worked with Harley Davidsons for the last 16 years. He says buying one of these bikes is much more a want than a need. Once you get your hands in one of them, you’re hooked. You become a member of motorcycle clubs, forge new friendships and experience a whole new side of life. Kaua‘i Harley Davidson dealership in Puhi. Kaua‘i Harley Davidson has been on the island for about 10 years. They offer an entire line of Harley Davidson motorcycles. For a little less than 10 grand, and for as much as $45,000, you can have your own piece of history and a ticket to a new freedom. Kaua‘i Harley Davidson is a “full-service dealership,” Baroni said. Just like a car dealership, they sell new bikes, offer financing, repairs, parts and services. But they go beyond the regular dealerships, also offering motorcycle rentals. Baroni says the rental department caters to people from all over the world, and gets especially busy from October through April, when there’s snow in the Midwest. Harley Davidson was founded in 1903 by William S. Harley and brothers Arthur and Walter Davidson in Milwaukee, Wis. But the seed for the company was planted in 1901, when Harley, then only 21 years old, completed a blueprint for an engine designed to fit a bicycle. In 1907, William Davidson joined his brothers and Harley. When Harley Davidson was founded, it was just another motorcycle company among many in the U.S. Over the years, Harley Davidson pulled ahead of the pack by sweeping many national championship races. In the 1920s, the Harley Davidson’s mascot, a pig, would be carried on victory laps after each win. And so the HOG association started. HOG, an acronym for Harley Owners Group, is a nationwide group, with countless HOG chapters spread over the U.S. Buying a new Harley Davidson on Kaua‘i also means a free one-year membership of the national HOG. Women can become members of LOH, or Ladies of Harley, by being a passenger or an owner of a Harley Davidson. Introduced in 1957, the Sportster is the oldest Harley Davidson model in continuous production. Available in 883cc and 1200cc, this classic lost the title of Harley’s beginner bike three years ago when the Street model was introduced. “The Street is a very entry level motorcycle,” Baroni said. Available in 500cc and 750cc, the Street is the only Harley Davidson that comes with a liquid-cooled engine. It means that when you’re sitting on a classic Harley Davidson at a red traffic light, with the heat of the air-cooled engine rising under your legs, the guy next to you riding a Street is a lot cooler, no pun intended. Besides selling Harley Davidsons — and lifestyles — the Puhi store also sells bikes from Yamaha and Kawasaki, including dirt bikes and four-wheeled utility vehicles. They also sell a Taiwanese brand of mopeds called Genuine. For a 49cc moped, a license is not necessary. But if you want to buy a bike from Kaua‘i Harley Davidson, and you don’t have a license, the staff can make it a lot easier for you get your license. Kaua‘i Harley Davidson sells a lot of apparel. Much of it is from Harley Davidson, with several T-shirts with designs exclusive to the Kaua‘i dealership. They also have pretty much everything available to go dirt-biking. Kaua‘i Harley Davidson is open seven days a week from 8 a.m. to 5 p.m., but the service department is closed Sunday and Monday. 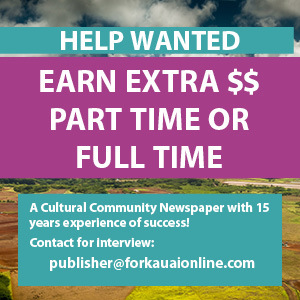 They are at 3-1878 Kaumuali‘i Hwy., across Kaua‘i Community College in Puhi. Call 241-7020 or visit www.kauaiharley.com for more information.